You’ve worked hard for several years and have built a company that does well year after year. You’re proud of what you have, but want a clearer picture of how the business is really doing. Perhaps you are a few years from retirement, and you see the next few years as a chance for a final push, to create something even better, add to your personal wealth for more comfortable later years, or even leave a legacy for the next generation. Or maybe your company has plateaued and you simply want more challenge in your work day, on a deeper level. You’re not exactly sure of what direction to pursue, but you know you need more than what you have. All the data you need to get a true measure of the health of your company and create strategies for growth and continued success is sitting in your accounting system. Based on my Financial Visibility Philosophy (see About Me for more on this), I have created a 4-step program that gives you a structured process for organizing this data into solid information that will allow you to manage what really matters to the health of your company, grow your company in new directions and evolve into the leader you have always wanted to be. Step 1: Trend Analyses – a detailed review of where your business is today. I prepare several key comparisons and charts using the data in your current accounting system. 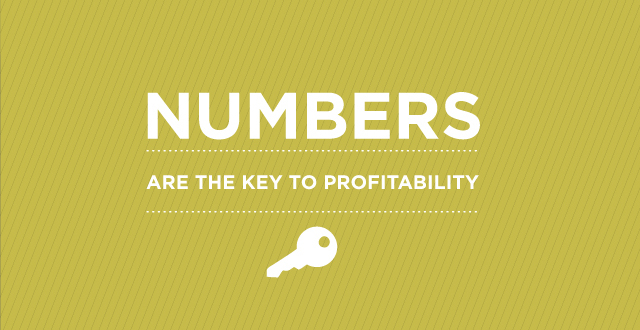 We identify exactly what factors are driving the success of your business. Step 2: State of Your Industry Review – no company can grow in a vacuum. In order to plan your future, you need to be keenly aware of trends in the marketplace, and what your competitors are up to that’s new and exciting. 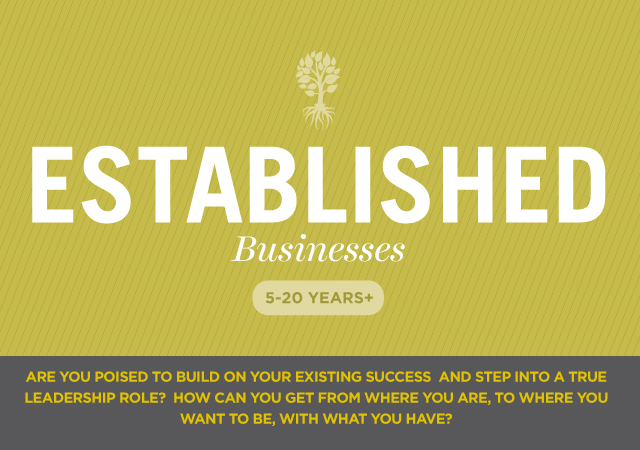 Step 3: Vision Statement – a re-envisioning of your Company’s future, incorporating your core values and purpose, with a focus on maximizing what are clearly your strengths and overcoming current weaknesses. 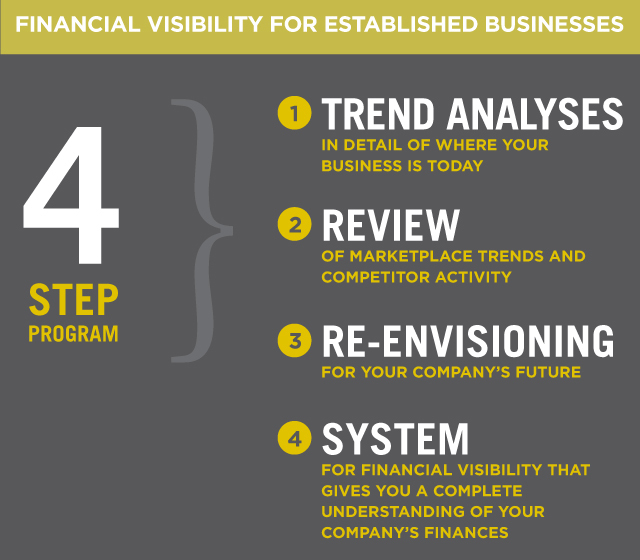 Step 4: Financial Visibility System – This is a series of procedures built around the financial information you are already gathering in your daily accounting. Your FVS is comprised of two key components that are the tools you need to choose your future direction with clarity and confidence and take your company to new heights. Together we take your expected revenue and costs and compile them into an annual budget and cash flow projection. From there we devise a tailor made VIP (Visible Indicators of Performance) Dashboard that measures your growth and monitors your progress. These tools empower you to manage the performance of your operations just like the CEOs of Fortune 500 Companies. Note: The companion Established Business Financial Visibility Program Workbook becomes your permanent record of the evolution of your Vision, the development of your strategies and your Financial Visibility Platform. It documents where you are when we start and your progress as we move through each of the 4 steps of the program.